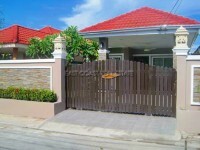 A 3 bedroom 2 bathroom house located in Cozy Ville in East Pattaya. Spacious living arrangement with separate kitchen and living area, 3 bedrooms and 2 bathrooms. Covering a total Land size of 44TWAH. Great location close to the Pattaya Elephant Village tourist attraction with a selection of local shops, bars, restaurants and supermarkets. There is a communal swimming pool on the development for use by residents only.